The mask was made with the same materials as the staff, but the mask was finished with melted brown and clear shoe polish. The staff has an articulated jaw, activated by a small trigger made of plastic. The costume was a success! I went out with it during the day on Halloween, to meet with colleague and recent customer Alexander Winfield to show him our in-progress puppet short film elements. Spontaneous responses from people on the street were encouraging, if a bit reserved. There weren't many costumed people, it didn't feel like Halloween. I'd have to wait for the cover of night to reach full effect. I went to a friend's family's home to help them scare the children while handing out candies. Fun! A lot of great reactions from people, and many compliments. Then I went to a Halloween Party/fundraiser for a small Theatre company, which was supposed to be a big bash. Around 10 people were there when I showed up. It maybe tripled while I was there. I knew nobody there, but I made quite an effect when I showed up. I was the only costume which really hid the person's identity. I danced a bit. At least I learned something interesting: when music is going to be played, the giant mask should have ear holes, to allow for better sound distribution inside. As it is, the acoustics inside my mask act as a massive bass booster, and I had a hard time hearing the singers on top of the instruments. So I removed the mask, which was a relief, it gets hot in there when dancing! Then the colleague who had told me about it showed up after about an hour. Had a few introductions, talked a bit, I proved my masks strenght (paper mache doubters present) by throwing it on the floor a few times, but we left early, the fun was not there. Then I went to my friend Dan's party, which was amazing. Inspired by who knows what, I made a very dramatic entrance from the dark backyard, with my hood hiding my mask completely. I asked "who is the victim", someone pointed to someone, I checked my hourglass, pointed, and I removed my hood. The sounds they made were very thrilling. Everything I had hoped for in this costume. I had inspiring conversations all night. I hope to meet some of them again. I haven't had that much fun at Halloween since I was a child! Thanks Dan! 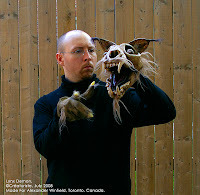 I'm going out again tonight, in the same costume, to finally see the show starring my macabre puppets. I can't wait to see them come alive without my direct intervention or a mirror! Today I thought of a simple way of holding a puppet head in a body, while making it removable at all times (interchangeable heads on this project). With my colleague Daniel, we ended up with a very strong and tight ball and socket movement. The system is very simple. 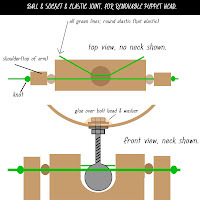 A spherical hole in the wooden body, for the ball joint of the neck, which could be metal, wood, or plastic. We had a metal ball bearing that had been tapped to add threads inside, to fit the bolt that makes the neck). Two holes are drilled very close together, on both sides (left and right) of the center of the neck. The holes are drilled from outside (tarting at an angle, away from the shoulder articulations) and reach within the neck hole. Elastic cords are run through each set of holes, making two straight lines crossing the neck opening. They are tided outside with knots, tightly. Now here's the only tricky part (not a challenge at all): how to insert the neck ball in there. All you need is two straight stiff rods of some sort. I use big nails or whatever piece of straight rod that's lying around. Lift one elastic out of the hole with one rod, and hold in place. Do the same with the other elastic. Slide the ball in there, release the elastics. The hold is very strong, it won't let go until you want it to. Tension on the ball bearing from the elastics pushing it on the wood makes a very tight joint, without any parasitic movements. Pull very hard to release the head again. We added a metal ring, made from a pipe we cut, to re-enforce the neck, but I don't think it's really necessary (but it looks neat!). I love this system so much, I can't wait to make another puppet for myself and give it this neck system! 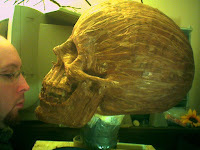 This is the sequel to Giant Skull Mask WIP. The skull mask is close to be completed. The first two pictures show texture of the paper mache Bark before the sealing (diluted Weldbond, two coats inside, one outside) and application of the Monster Bone finish, which has softened it and made the whole mask come together. The yellowish paint job on the last picture is the first step of it. 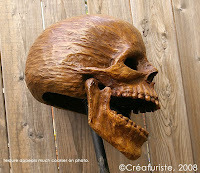 Much more staining and aging will be required. 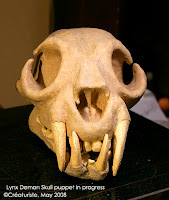 As a solution to reduce friction and noise that was happening from the stiff wire, I used a braided black cord to hinge the lower jaw to the skull. The compromise that comes with this choice is that I see the black knots outside the jaw, which I made as clean as possible, by trimming close and gluing with a drop of hot glue. The more I look at them, the less I worry about it. After all, a skeleton creature, without tendons or muscles, must need something to hold the lower jaw in place! I was lucky to find a bicycle helmet that fits my head perfectly. It fits inside the skull mask, and brings my eyes level with those of the mask. The helmet's straps allow total stability and ease of movement. The mask, made of paper mache, is so lightweight that I don't need extra support like heavier masks would need, such as a harness from the shoulders. The biggest remaining step is to build a foam chin piece that will activate the jaw without the need for a strap. It has to be low profile enough to allow for enough depth in the open jaw to appear like an endless hole of darkness, once the black veil is installed in the jaw to hide my face. The costume is a simple black robe with long falling sleeves. I made a separate hood that fits the giant mask's size. This separate hood prevents the need to cut into the robe, which will allow me to re-use the robe for future costumes. I was looking for a natural fiber look, without paying the high price of linen, which would definitely have been my first choice. I was glad to find this 100% polyester textile which had a "linen" look to it, at a very affordable price. The weave is not too tight, allowing enough breathing while still being sufficiently opaque. All Hail You Mighty Lords Of Nowhere! Written and performed by Alexander Winfield. A new Puppet Show about two demons and the end of the world. 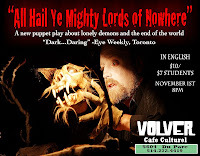 Performs In Montreal, on November 1st, Café Volver, at 8pm. Puppets by yours truly (see the Macabre Puppets). hopefully with articulated jaw when completed, if time allows. 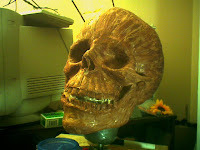 Re-useable skull form is newspaper and tape (masking tape and clear packing tape for rigidifying and smoothing). That form was built directly over a loose copy of my head, made with Duct Tape filled with newspaper. Mask itself is (for now) paper mache strips (coffee filters and outdoors carpenter's glue, diluted just a bit with water). Note the wrinkles, caused by crumpling in one direction and applying directionnally. Those wrinkles provide strenght as well as looking good, if well applied. the effect can be softened by adding a layer or two of thin soft paper in the usual flat method. When finished, the mask openings and jaw pivot points will be lined with wire and more paper, for strenght. Padding inside will be done with a soft foam, lined with a non-porous foam (Fun Foam, also called Foamie) to prevent sweat absorption by the mask, and provide comfort. The eyes, nose and jaw openings will have fine see-through black mesh to hide the wearer. The dream is to also build a pair of giant skeleton hands, but I'm not really counting on it for this Halloween, too many projects at once. 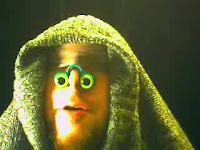 This is a test of the Peepers puppet on my nose. 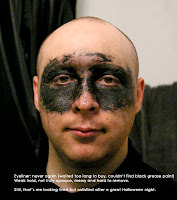 I was wearing a piece of nylon sock over my eyes, so that they wouldn't show and distract away from the new facial configuration. It's fun for a short, one-minute gag, but it slips away from the nose tip quite fast. It stays longer if put on upside down, but it looks less convincing, and hides the nostrils. Sorry for the extra footage, my ever-wacko webcam seems to suddenly add invisible data from previous reccordings, which are only revealed when converted into Flash format! I Can't seen to be able to edit it out!!! Consider it "behind the scenes", because you can see me put on the "costume". By the way, it's only sweat I'm wiping from the outside of my nose. Mom raised me well, after all. Peepers are an original product of Puppeteer Hobey Ford. No affiliations, I'm just a happy customer! Tunic, Pants, bag and Hood patterned to size and made from scratch, hand dyed to alter color and age. Tunic's upper body's pattern based on a contemporary hemp shirt (buttonned) I had at home (brand: Green Babylon). Knife and sheath both made from scratch. Leather Belt cut to size and assembled from parts. 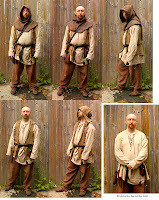 Brown vest with rough hood made from old linen shirt. Leather shoes, purse and smallest pouch patterned and made from scratch. I made this costume to attend the medieval-themed wedding of two dear childhood friends. 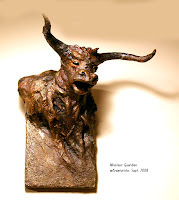 The Minotaur wall plaque is an original creation and is the Groom's gift, while the Door Knocker (copied from the movie Labyrinth) is the Bride's. Both gifts were very well received! 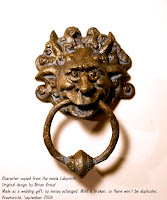 I'm sorry to report to those who knew I was making the doorknocker, that I failed to make it strong enough to be used as an actual doorknocker for the exterior door. Mainly due to lack of time to develop a better friction-free system to hold the ring. After all, it's made of paper mache, and no matter how incredibly strong it can be made to be, it won't withstand constant use unless precautions are taken. I showed up at the subway station, waiting for a friend to pick me up, fully costumed, with a large walking staff (not pictured above). I,m used to look different nowadays, but I did received some odd glances. The wedding was happening in a remote country Inn which was all our own for the day and night. I was the only one there in costume, until right before the ceremony. I'm used to being the odd one, and the old pals saw I hadn't changed much... Most people's reason for the delay was that their costumes were too warm. I'm glad I made mine in layers of relatively light fabrics. Although I wouldn't want to run for very long in this attire, it's quite comfortable for a beginning of Autumn season. I want to wear my tunic more often, perhaps I will remove the "skirt-like" bottom and turn it into an everyday attire. I do have some neat dark lue fabric, to eventually make something like that, but looking more clean. I was the only one there with a costume designed to look worn and modest. I can understand the appeal of the much more colorful and fantastic designs of the Nobles and Clergy of medieval times. But I've always been much more attracted by costumes "of the people", such as seen on the crowds and secondary characters in "period movies" like Robin Hood prince of Thieves, King Arthur, and LadyHawke. Most costumes at the wedding were very well done, some were quite magnificent. The King and Queen's costumes were brilliantly designed and made by the Bride. I was impressed with the inventiveness of those who made their own costumes and/or props. Some were good with fabrics, some with leather. There were even two chain mail tunics, which were both fantastic. We all got the excellent surprise of having the famous medieval band Skarazula play at the feast and evening. Lots of us were fans already. No one knew it was to be them, except the wedding organizer. What a treat when we saw them come in! I highly recommend their lively music, featuring a wide array of traditional instruments. They brought high energy from all over the world. They made us clap and dance, showed us two dances in a really fun and efficient way, really a fun time to be had! I just wish we could have had them for much longer! If I ever get married, the medieval theme might be something to consider, it was a great time! Lady of the alive inner-child, with like-minded love of the arts, Where Art Thou? I did this quick sketch of a man who's supposed to have bird-like facial characteristics. I worked without any visual reference, following my own sets of "rules" for the character's evolution. Still, the result resembles the design of Mr. Burns from The Simpsons. How much resemblance, however coincidental, is too much resemblance? The puppets are done (finished on the 16th) and now in the hands of the satisfied customer! The characters were renamed by the customer, as planned. I love what he came up with: Tibbs the Apocalypse Cat, and Tatoon! UPDATED: the show did a good first run in Toronto. The show is coming to Montreal on November first 2008. This is where the Lynx demon is at now. He moves well, and I love his wild hair. The eyes are going to be made lighter, more white, while keeping the bloody veins partly visible. Maybe cataracts? He shall have no body, his head floats in the nothing, and so will his clawed gloved hands (stained cotton gloves equipped with claws made of carved hot glue sticks. Looks sharp without any danger to the puppet. Fur sprouts through as well). This is where the "Serpentine" demon is at now. He still needs a bit more paint job and a disgusting body (more like a tentacle ending with the puppeteer's hand), which shall be finished soon and pics uploaded here..
Three evenings left to finish the two. I'll be very sad to see those two go, more so than usual. As I get over the mourning, I'll try to remind myself that they are growing up and need to leave the nest to terrorise and theorize the people on a real Theater stage. A while ago I made my own variation of Monster Mud: mixing pva glue with joint compound and adding color (instead of mixing latex paint with joint compound). My goal was to increase adherence, flexibility and strength, it worked. But it was too heavy in weight for my tastes (I make comfortable puppets, I need them to be as lightweight as possible) The joint compoumd was the heavy element, so I needed to use less. Well, tonight I made it much better, and not only in weight! I diluted some Weldbond just enough to make it liquid. Then I added some joint compound to bring it to the consistency of a well made brown gravy (or that of Caesar salad dressing). Then I tinted it with a small amount of dry titanium white pigment, and twice that amount of raw sienna. I should mention that my joint compound appears to be gray when wet, but dries slightly off-white. This finish was applied in a stippling fashion, with a soft hogs bristle brush, directly over my pm strip project. Yikes! It's semi translucent! This means depth and randomness effect automatically! Each layer can be dried and another one added, then as many as you like. I'm at three layers, the depth is amazing. The finish is perfectly matte, and scratch resistant. Just like the older version of the finish, this one will absorb paint very well, so using diluted paints will give you a watercolor effect. Spray the surface slightly with water prior to painting. you can do a wet-on-wet technique, almost exactly like watercolor. When perfectly dry, it can be sealed with a bit of heated clear shoe polish, rubbed in then wiped off. Painting it with any gloss medium or varnish would probably just kill the effect. But I encourage you to try it, you might find something even more interesting! Please share. Maybe a spray matte or satin varnish would work well too. Oil based varnishes are usually much stronger, but you won't be able to re-touch with acrylics. This finish should work well on most clean porous surfaces, such as wood, paper mache (strips or pulp), paper, canvas, and perhaps even some stones. If you do not find Weldbond in your area (mostly a North American product), a good quality pva glue (white Glue, such as Lepage or Elmer's) should work very well too. Make a test in a small batch to be sure your pva glue does not react badly with your choice of joint compound. Mine is made of joint compound and diluted white glue (preferably Weldbond, but regular white glue works fine too), with artist pigments or acrylic paints for tinting it. My version is more adhesive and more flexible, even in thin applications, to avoid cracking caused by movement, impact and time. I use it a lot on my puppets and masks for Theatre, so everything i do has to be very strong and durable. This product answers that call very well. It can be applied in so many ways, creating so many different textures: painted, stippled, spatula, splashed-on, poured on... It can look like bone, rock(smooth or rough), leather, dirt, bark and I'm sure many other surfaces as well. It sands very well and very smooth. While wet, a denser formula of it can be detailed with a fine tool. Over an already existing texture, it can be used to smoothen and soften the effect. It hides small surface imperfections quite well. I've recently use it as an adhesive to attach facial hair (mustache) to a puppet which already had the same formula (same bacth actually) as a basecoat. Result: the hair looked like it was actually growing out from the skin. Not microsscopilcally perfect, but very effective, even up close. The bond is very strong, thanks to the glue content. more matte in finish. The more glue, the more flexibility and adherance. The more water in the glue, the easier the mix will be to apply with a brush (but don't add too much water, it would weaken the adherance and flex of the mix. If the washes are applied while the surface is not quite dry, the colors will react with the products inside, and create wonderfully unpredictable natural variations. Similar to the "wet on wet" principle in watercolor painting. Once the painted item is dry, it can be sealed with some liquid matte varnish, or clear shoe polish, heated to ease absorption into the surface. Nice leather-like effect with shoe polish. It is my second version of the recipe, making it much lighter in weight, and smoother by itself, even before sanding. It can also be used as an antiquing medium. Very diluted, it would dry unevenly and create nice heavy dust or dirt effects. What at first could have been a weakness turns into a great finishing option! This finish is re-soluble! Just wet it a bit, then rub with fingers or stiff brush to smooth the surface prior to painting. This way of mosothing brings the surface to a look almost identical to fired clay. Can also be done after painting, as long as paint was applied in washes and has not sealed the surface. The finish doesn't melt on its own, it does require rubbing, or long exposure to the water. So, even the unsealed works can still withstand a bit of rain, if not left in it too long. Sealing this surface can be done with diluted Weldbond, or varnish or melted shoe polish. Update: I now call this method Paper mache bark, or "Barking". I've worked one extra day with this method, on another head. On this one, instead of making small bunches of pasted paper, I applied each large piece as a crumpled strip of about half an inch wide, following the curves of the form. It's much easier to control, and I suspect it will give a much stronger shell when dry! It looks like bark, hence the name. The texture is quite coarse, which is interesting as-is. If subtlety is needed, it can be easily smoothed gradually, by adding an extra layer of very thin paper (this one regular paper mache strips, uncrumpled). I did it in some areas where two directions of paper strips meet. It's instantly better, without killing the life of the "skin". I've used this smoothing-with-paper method on all paper mache methods, and it saves me hours of sanding. Today I've had a breakthrough, which I'd like to share. 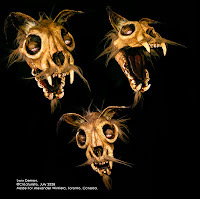 I wanted to keep a copy of my demon skull puppet, but didn't feel like applying eight layers of paper yesterday, as it usually takes a full 8-hour day just for that. Time was short, so I took a chance. I mixed some suggestions from Cary from the PMA group (squishing pasted paper to build volumes and small objects), and Jonty from the UK, (his tissue clay method, but I used brown paper towels instead). The following could be done with various papers. I chose brown paper towels because that is what I had left in the color I wanted (earthy browns are my favorite basecoats). I find it harder these days to find unbleached coffee filters for some reason (which would be my first choice for smoothness and awesome strenght). Toilet paper will work, but will most probably give a pebbly surface, a look typical to most "paper mache pulps". 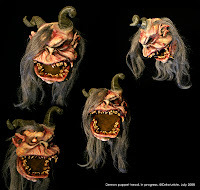 My form was a Plastalina (oil-based modeling clay) model of what I wanted. It was protected with a layer of plastic wrap, well applied and conforming to all the details. Some sharper points had to be made separately with crumpled aluminum foil. When the paper shell was removed later, those aluminum foil pieces were left inside. I applied one layer of brown paper towels everywhere. This first layer will be the smoother inside surface of the shell, and also a support for an otherwise uneven application (of the future layers, as you'll see). The next layer will be equivalent to between 6 and 8 layers, all at once. All I did was paste diluted white glue on both sides of palm-sized pieces of brown paper towels, and laid them over the object while crumpling until the paper occupies less than half it's original surface. Thus creating many many multi-directional folds. It is important to avoid using too much glue, it would bring brittleness and take longer to dry. Every new piece has to overlap previous ones at least partially. Speed-drying with a heat gun dries the surface to the touch, allowing for reworking with the hands and other smooth hard tools until smoother. Squishing helps expell excesss glue and make a stronger, more compact result. If care is taken to apply ever piece in about the same size and crumpling fashion, the texture is very interesting and can be controlled. If smoothness is required, an extra layer of paper will smoothen everyhting quite nicely, while leaving a bit of surface variation, which in most cases looks "right" and natural, especially good for stage-lit work. Repeat speed-drying, squishing and rubbing as needed. I speed-dried the whole thing in the oven: placed item in oven, turned on at 250F until temperature was reached, then left it in until cool. I left it for about 5 hours in the remaining heat. It was very dry when I took it out. Once cut away from the form, it has to be re-assembled immediately. The pieces are temporaily held together by masking tape, which shall be gradually removed and replaced by more paper. I used the same crumpled paper as before, to close the gaps between the pieces, careful not to overlap over the masking tape. Speed-dry, squish flat and smooth, then speed-dry in oven. Or in front of a fan, at lowest setting, for a few hours. All you really need is a little bit of air circulation. Heat is only necessary when you are in a hurry. The result is a hard enough shell with a bit of flex. It is nowhere as strong as 8 layers of coffee filters (my usual), but it is more than enough for most applications, including puppetry, if proper care and respect is given to the puppets. I don't yet know if my usual strength test (throwing against a wall or on the floor, violently) will damage this new puppet, as it is drying now (added some pieces). I could probably add one final layer of paper strips to the dried puppet head, using brown coffee filters. This added skin would be smoother, because that's what I usually want my puppets to look like, and would also add strength to the already very strong surface. Smoother is not always better, but I find more and more that it's good (for the project as well as the technical ego) to be able to make it extra smooth, when needed. 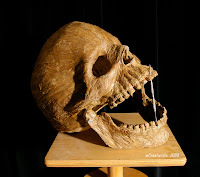 The puppet's skull is dry now. It's very strong, more so than I expected. I still feel a few soft spots, but I could leave them as-is without any problem. But you know me, I won't! It's decided, I love the texture so much that I'm keeping it as my finish. I might even decide to not include eyes or teeth! He looks nice enough with empty eye sockets and toothless baby look. The texture is so cool that I decided to keep my puppet simpler than the customer's, to showcase the texture rather than any decoration. -every cut edge, including the tiniest holes, must be re-sealed with at least two layers of well-overlapped narrow pieces of the same paper and glue. Do not neglect this. I have plenty of proofs that major warping does occur when moisture (even a little) gets inside the raw edges and seeps inside. My over-the-head pumpkin helmet mask is so warped it cannot be worn anymore, and the wide open mouth has now closed. I had not sealed any edge, because I made the whole thing in 4 days, wanting to wear it at an event. I regret not having fixed it as soon as the even was done (2 years ago), as it is now just getting worse with the seasons. Paper mache being what it is, I can still save it when I have time. I'll wet the warped areas until soft, re-shape, speed-dry, add a wire rim, seal all edges, and dry in front of a fan. I've done it for my older puppets before, it works well, but it can take a bit of time and meticulousness. -seal your project properly in order to help keep it protected from moisture and contaminants, which can cause warping and mold. To seal a paper mache project, you need top use a glue or a medioum which is compatible with the glue you used to build the object. If you used carpenter's glue, paint a layer or two of slightly watered-down Weldbond over everything. It will seal and give a perfect ground for acrylic paint applications (acrylics don,t like yellow carpenter's glue, and crack over white glue). If you can't get Weldbond, paint a basecoat of pure undiluted and unmixed artistic quality acrylic paint. It works well with Liquitex. Wait for it to be prefectly dry before doing anything else to it, otherwise you'll get surface peeling. If you used white glue, Weldbond is a good sealer. If you can't get Weldbond, an acrylic medium(gel or liquid) is ok.
DO NOT USE ACRYLIC GESSO to seal a paper mache project. It makes it softer at first, then quickly makes the object brittle. I've tried with the brands Liquitex and Stevenson, and a few cheaper store's-own brands. All create this problem. Gesso is also problematic wit Weldbond. Mix the two together and you get a weird hard-cheese-like substance that doesn't stick anymore. As an alternative (and a great texture), try the Monster Bone finish I shared in this blog. This finish dries absolutely perfectly matte and totally porous, accepting therefore very diluted applications of paint. This means even the glossy paints will show to be matte. The more paint you add, the more pores get closed, and the more closed, the more glossy it gets. When totally dry, you can seal (only if you want) with a bit of clear shoe polish, that you can pre-heat and apply with a brush, then rub well with a clean lint-free rag. I hope this comes in handy for some. Click on Video for movement! Head and neck are one piece, with neck ending in a ball shape. The sock's top is wrapped over the ball with a rubber band. Puppeteer's hand is inside the sock, fingertips holding the ball, and rolling it in any direction required for movement. Arms could be added to the body (I intend to for this puppet's project), making sure to include a re-enforcing material inside the sock to precent unravelling (small plastic doll joints, or a washer made of fabric, perhaps). The arms will be activated by rods on a pivot inside the hand, or wrist, or elbow, depending on what works best for this size and puppeteer positions within the sets. The sock is not pierced, so it will not unravel, and could easily be removed for washing, or for changing the puppet's body. I used a fuzzy, very stretchy sock made of synthetic material (Polyester and Spandex for this one). This type of fancy sock is sometimes hard to find, depending on the season and what is the current fashion. One brand: Bochi Brothers. This is a quick prototype to solve a specific puppet's problem, which turned into a whole other type of puppet. It happens, and this time, it was for the best. A longer neck inside the sock might improve grip for finer control. (UPDATE: I implemented it, it works!) You see irregular shapes while the head is moving (hand inside), but with a costume, it would be less noticeable, and even less if there was some sort of semi-rigid shell inside the top of the sock. Or the underlying movements could be exploited, a Blob person might be interesting! For the curious, the head is a core of compacted (hammered) aluminum foil, the neck is a dowel, all is covered in Celluclay(paper mache product from Activa), applied and dried in multiple stages, then sanded. (still in progress).